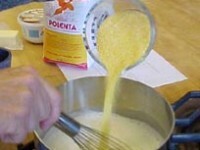 Polenta is cheap and easy — a caterers delight! Peel, core and slice the apples in 1/2 inch slices. Melt the butter in a medium-sized frying pan over mod. high heat, add the sliced apples, sprinkle over the sugar. Continue to cook the apples over mod. 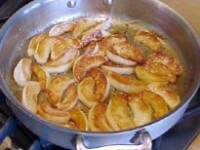 high heat, turning occasionally, until the apples are golden and soft when pierced with a fork. In a small frying pan, over mod. high heat, place the walnuts and cook, tossing until slightly toasted. Remove from heat. 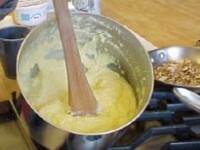 To serve, place a serving of polenta in a bowl, cover with apples, sprinkle with walnuts and serve with maple syrup.